Milk and dairy foods don’t just taste delicious, but they’re also good for your body. 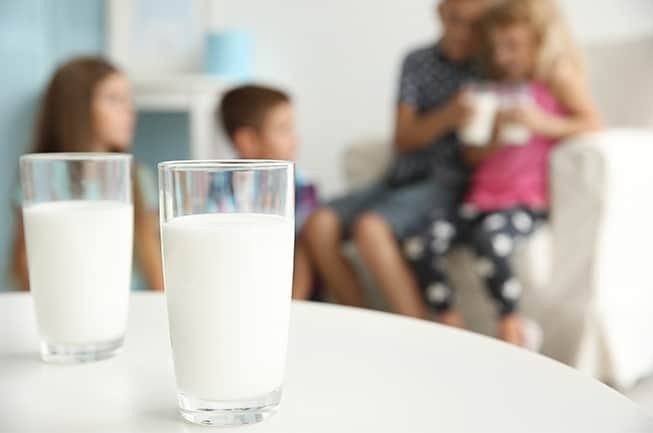 Drinking 8 ounces of nutritious milk can help you get one step closer to meeting the Dietary Guidelines for Americans’ recommended 3 servings of lowfat or fat-free milk and dairy foods a day. How important are milk’s nutrients to my health? Calcium (25% Daily Value, or DV): Calcium helps build and maintain strong bones and teeth. It also plays an important role in nerve function, muscle contraction and blood clotting. Niacin (10% DV): Niacin (or niacin equivalent) is important for the normal function of many enzymes in the body and is involved in the metabolism of sugars and fatty acids. Pantothenic Acid (20% DV): Pantothenic Acid, also known as vitamin B5, helps break down fats and carbohydrates for energy, manufacture red blood cells and maintain a healthy digestive tract. Phosphorus (20% DV): Phosphorus helps strengthen bones and generates energy in the body’s cells. Protein (16% DV): Protein builds and repairs muscle tissue and serves as a source of energy during high-powered endurance exercise. Riboflavin (35% DV): Riboflavin, also known as vitamin B2, helps convert food into energy — a process crucial for exercising muscles. Vitamin A (15% DV): Vitamin A helps maintain normal vision and skin, helps regulate cell growth and maintains the integrity of the immune system. Vitamin B12 (50% DV): Vitamin B12 helps red blood cells that carry oxygen from the lungs to working muscles. Vitamin D (15% DV): Vitamin D helps promote the absorption of calcium and enhances bone mineralization.